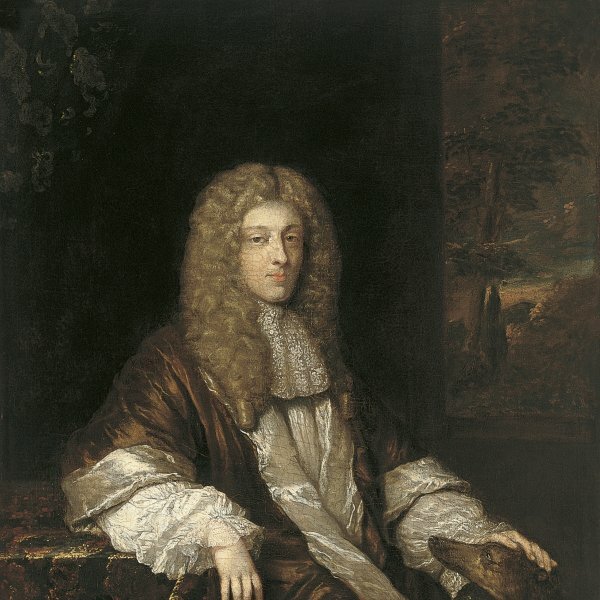 Gerrit Adriaensz. 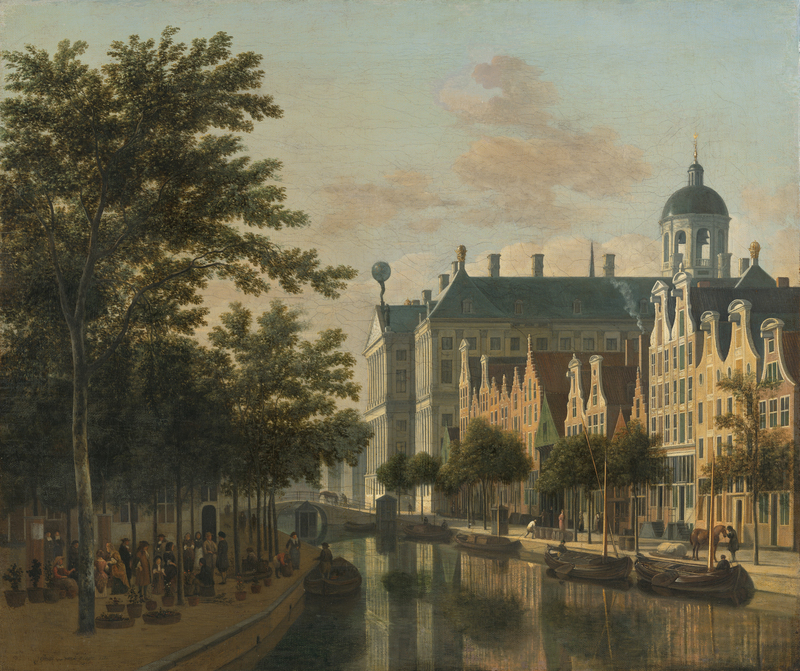 Berckheyde painted urban views of cities such as Haarlem, Amsterdam, The Hague and Cologne. As a young man he also visited both Cologne and Heidelberg with his brother Job. Berckheyde studied the work of his predecessor Pieter Saenredam and faithfully reflected the principles of that artist, who invented the genre of architectural paintings with buildings depicted in a careful, rigorous manner. In addition to painting scenes of town squares, buildings and streets, Berckheyde also produced Italianate landscapes and hunting scenes although his urban views are considered to be his finest works, whose buildings and locations he repeated with variants in his paintings. Berckheyde generally depicted buildings in conjunction with large spaces such as town squares, which he filled with groups of small figures that function to emphasise the architectural elements. In the present canvas Berckheyde depicts a central location in Amsterdam, specifically the canal that runs behind the Town Hall, the city’s most celebrated building and the symbol of its economic might. The canal, which opens up the composition and creates the spatial depth as it recedes, was covered over in 1884 to construct a street. On the left bank, which follows the curve of the canal, Berckheyde has depicted the flower market set among trees with slender trunks. Here we see groups of standing and seated figures, making their purchases from the flowers and plants arranged on the ground in attractive pots. In the right in the middle distance is the Town Hall, designed by Jacob van Campen and built between 1648 and 1665, crowned with an octagonal tower with a dome. On the top of the tower is a sculpture of Atlas holding up a celestial sphere by Artus Quellinus. The right bank of the canal creates a marked diagonal through the façades of the narrow houses with their stepped profiles and steep roofs. Gaskell referred to four more versions of the present work but only this one is dated. Basing themselves on the changes that took place in Amsterdam over a period of around fifteen years, Walsh and Schneider established a chronology for views of this location that starts around 1665 with a drawing by Jan Abrahamsz. Beerstraten, which has the same viewpoint as the present work and shows the octagonal tower of the Town Hall with scaffolding on it. This is followed by two paintings by Berckheyde now in Amsterdam and St. Petersburg, dated to around the late 1660s or early 1670s, followed by the one in the Carter collection in Los Angeles and the one formerly in the collection of Lord Francis Pelham-Clinton- Hope, which are somewhat later than the previous two. The series concludes with the present canvas, which is dated 1686. The present painting was in the collection of Sir Francis Cook and his heirs from the early 20th century until it was sold anonymously in London in 1959, the year that it was acquired for the Thyssen-Bornemisza collection.